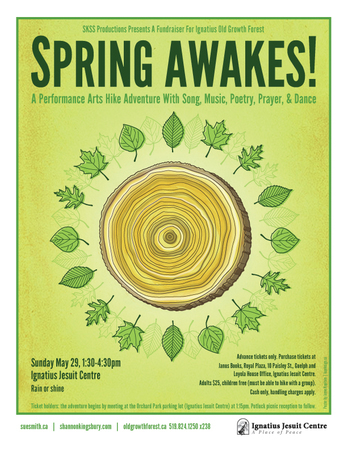 a guided contemplative hike with music, poetry, dance and song to celebrate spring. Performers will include Solana del bel Belluz, Gary Diggins, Peg Evans, Neal Evans, Dean Huyck, Louisa Kratka, Ondine Chorus, Jennifer Story, Laura Story, Jesse Stewart, Lucas Tensen, Brad Woods and more! Tribute to James Taylor at Hugh's Room in Toronto. Congratulations to Beth and Emily! 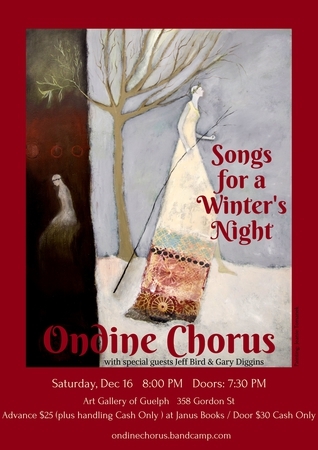 with Ben Grossman, Jeff Bird, Gary Diggins, Ondine Chorus members. 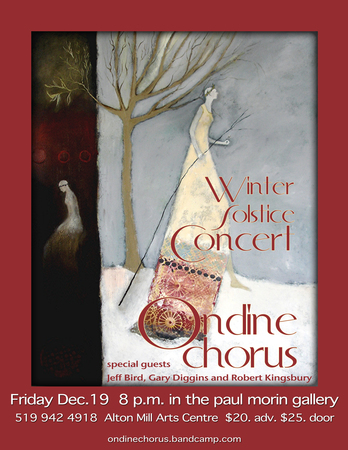 Ondine Chorus will be joining Tim Moher, Randy Lyght, Tori Miller, Derek Hines, Rebecca Binnedyk, Amanda Kind, Jessie Treneer, Robin Habermehl and more! 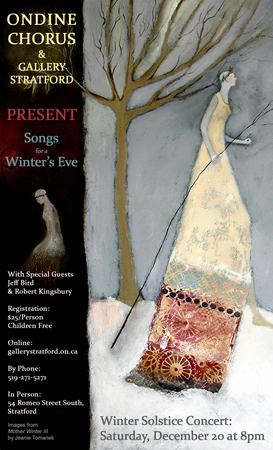 Sue Smith & Jeff Bird will be joining a wonderful gathering of elders, singers, musician and authors. 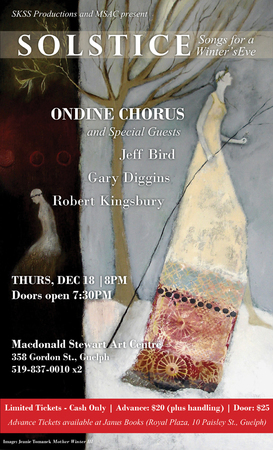 Ondine Chorus will be singing with Gary Diggins in his piece, "Postcards From Africa", a musical journey based on Gary's work in Africa. 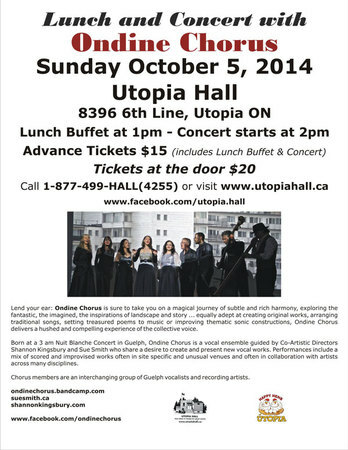 AFRICAN SANCTUS will be performed by the Guelph Chamber Choir. 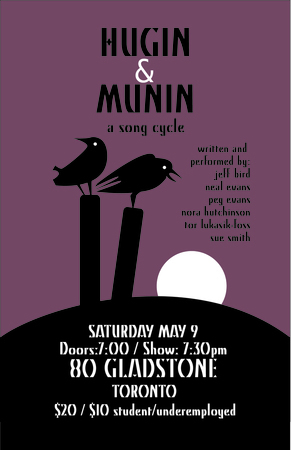 Sunday May 29, 2016 Tickets are on sale now at Janus Books, 10 Paisley St., and Loyola House Office, Ignatius Jesuit Centre. Come and walk in the beauty of the spring forest. 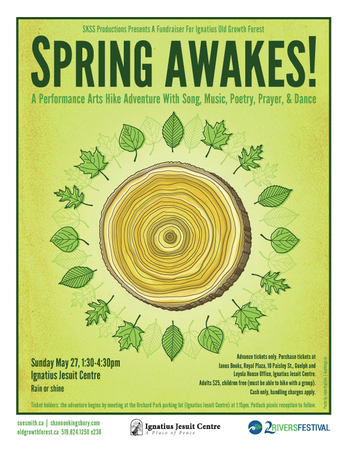 At every turn of the trail you may encounter trilliums, flushing trees, the rushing river, birds, poetry, song, dance, spoken word, music, drama - all in celebration of spring. 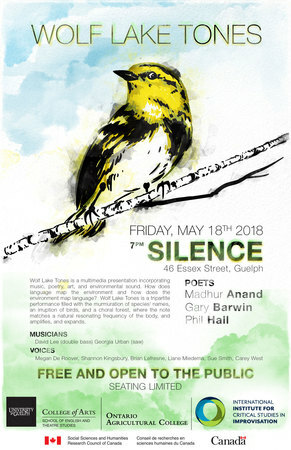 All proceeds from this event directly support the Old Growth Forest at Ignatius. 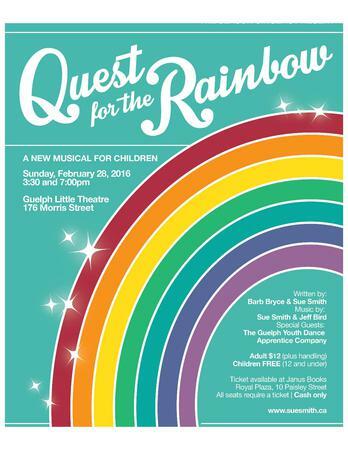 Quest For the Rainbow! Season Singers Session XXVIII! 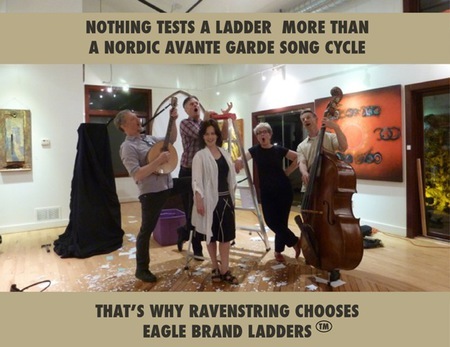 Sunday February 28 3:30 pm & 7:00 pm at the Guelph Little Theatre, 176 Morris St., Tickets available at JANUS BOOKS, 10 Paisley St. $12 Adults (Cash only, plus handling) Children 12 and Under FREE. All attendees require a ticket. 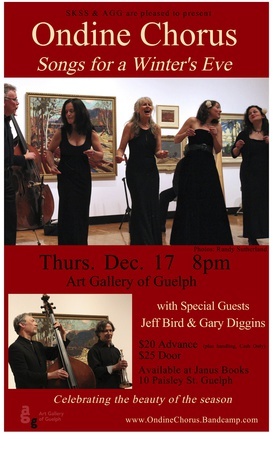 Thursday Dec. 17 Art Gallery of Guelph 358 Gordon St.
WHITBY HARBOUR DAY Saturday August 15 Sue Smith and Jeff Bird in Concert...Port Whitby Marina, 301 Watson St. 5 pm. This is a FREE community event featuring lots of live music, and an amazing array of performers including Bollywood Dancers, Debwewin Singers, African Dance and Drums, Mumbai Standstill and so much more. 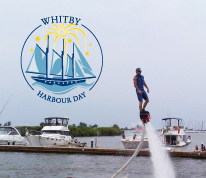 Saturday September 12 HY-HOPE Farms 11 am till 4 pm. 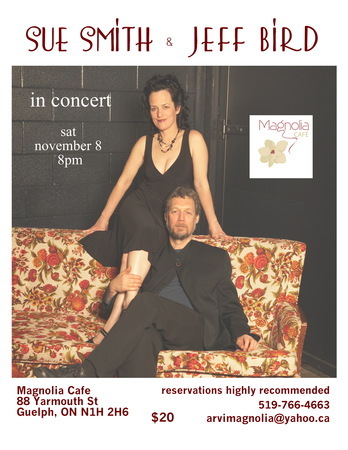 Come for the music, come for the beautiful outdoor deck, come for the home-made pies and wonderful fresh local produce. 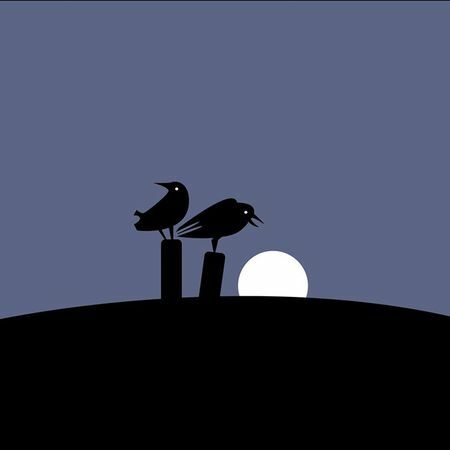 LATITUDES STORYTELLING FESTIVAL Saturday July 11 and Sunday July 12 in Kitchener's VICTORIA PARK. I'll be doing solo shows on Saturday at 1:30 and Sunday at 3:30 on the Adult Stage. Spring Awakes! 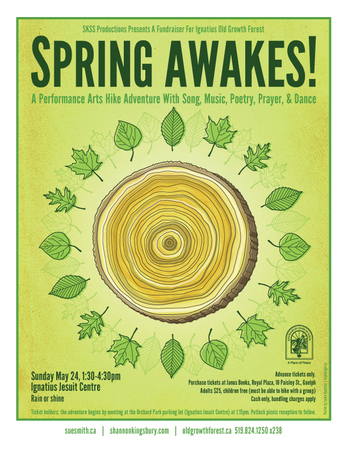 the 4th Annual Performance Arts Walk to raise funds for the Old Growth Forest Project at Ignatius Jesuit Centre 1:15 pm - 4:30 pm on SUNDAY MAY 24 The spring woods will be alive with birds, leafing trees, trout lilies, trilliums, song, dance, poetry, music and surprise. 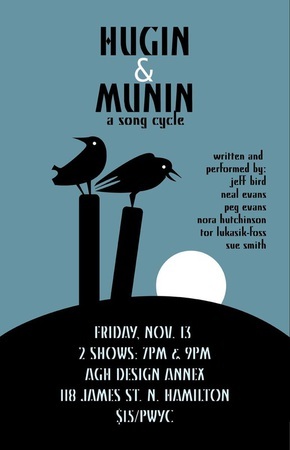 Tickets: $25 Adult. Children are Free but must be accompanied by a ticketed adult. Available at JANUS BOOKS, Royal Plaza, 10 Paisley St., Guelph Cash only. Handling charges apply. 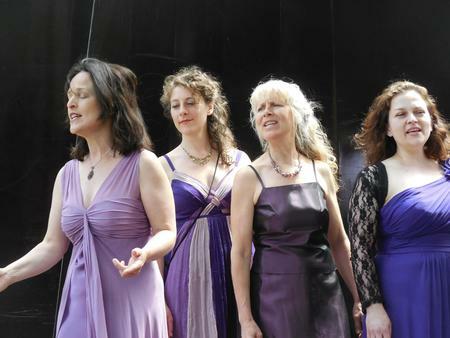 In June: ONDINE Chorus will perform a Solstice Concert and facilitate a workshop at the Labyrinth, Five Oaks Centre, Paris ON. 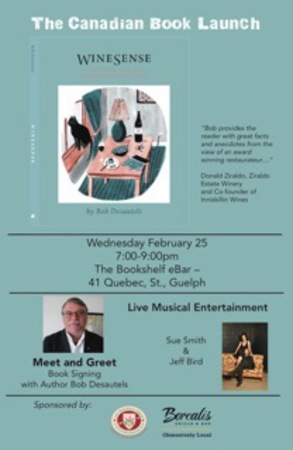 Jeff and I will be helping to celebrate the publication of Bob Desautel's new book "WINESENSE - The Three Keys to Understanding Wine" - at the Bookshelf, Wednesday Feb. 25, 7 - 9 pm. 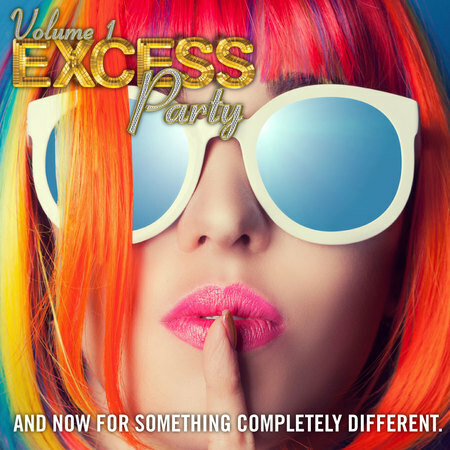 Book signing, remarks from the author, music! ...celebrating Bob and his new book. 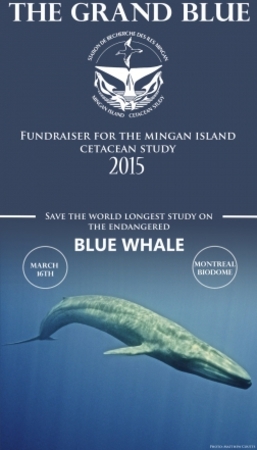 Jeff and I will be performing at the Biodome in Montreal on March 16 as part of this fundraiser for Mingan Island Cetacean Study, "The Grand Blue". 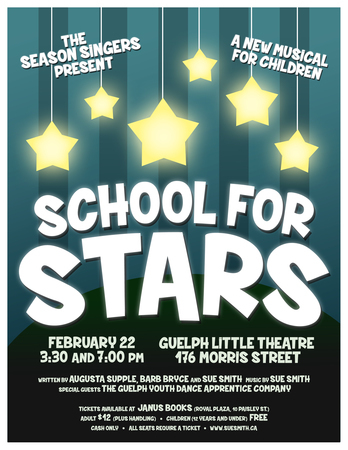 Guelph Little Theatre 3:30 pm and 7:00 pm $12 Adults, Children 12 and under Free. 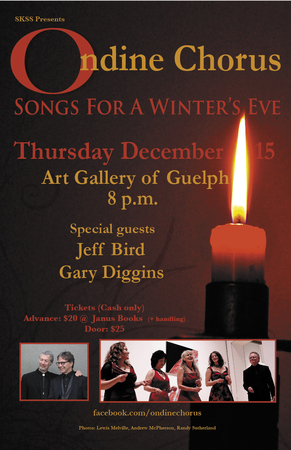 Tickets on sale at Janus Books, Royal Plaza, 10 Paisley St., Guelph. Cash Only. 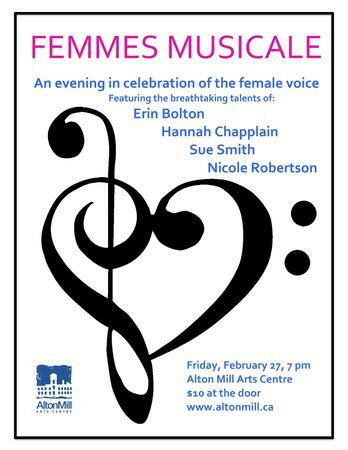 I'll be joining Erin, Hannah and Nicole for this evening of song @ The Alton Mill Arts Centre 7 pm $10 at the Door. Sat. 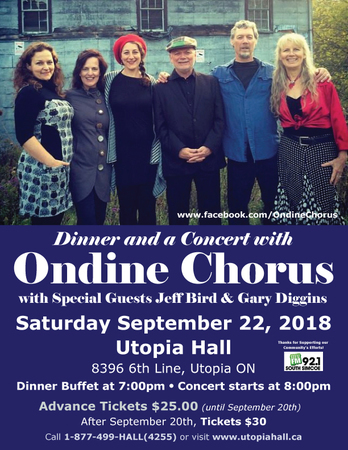 August 23, Murphy's Barn, Settler's Village, Bobcaygeon: Sue will be singing and playing and joining forces with George Hewison and Johnathan Lynn for "Limestone Blues", and evening of song and verse, raising funds to support CFRAD in Bobcaygeon and area, opposing a proposed Mega-quarry.